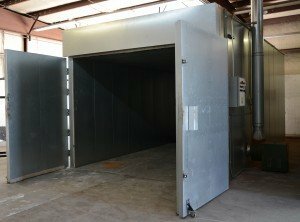 If you use a walk-in sized batch powder curing oven for your powder coating operation, you may have questions about how to consistently get the best results from your equipment. The oven’s performance–particularly the air temperature and airflow inside the oven–can make or break the quality of your finished products. 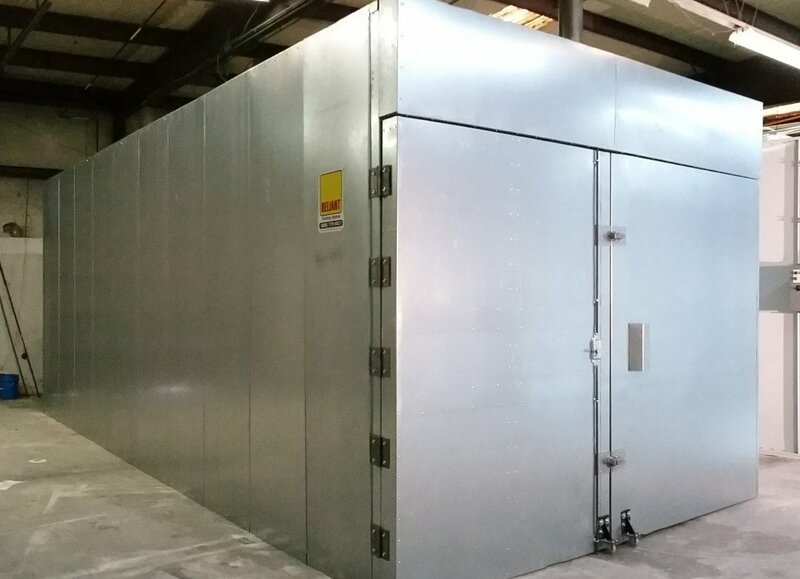 Powder coating ovens can be built to nearly any height, width or depth. 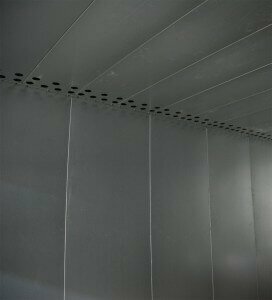 The ideal size for your project is dependent upon what you are going to be coating. No matter what you want to coat, the entire object needs to fit inside the oven with room to spare. For more information on oven sizing guidelines, click here. Depending on which brand of oven you have, heated air is usually blown into the oven via ducts in the ceiling or wall, or sometimes both. When curing, make sure you have enough space between the ductwork and the parts. If the parts get too close to the ducts, the powder can get blown off and you will have to rework the part. Likewise, if a part touches the oven’s interior, the powder is likely to either rub off completely or flake away during curing. 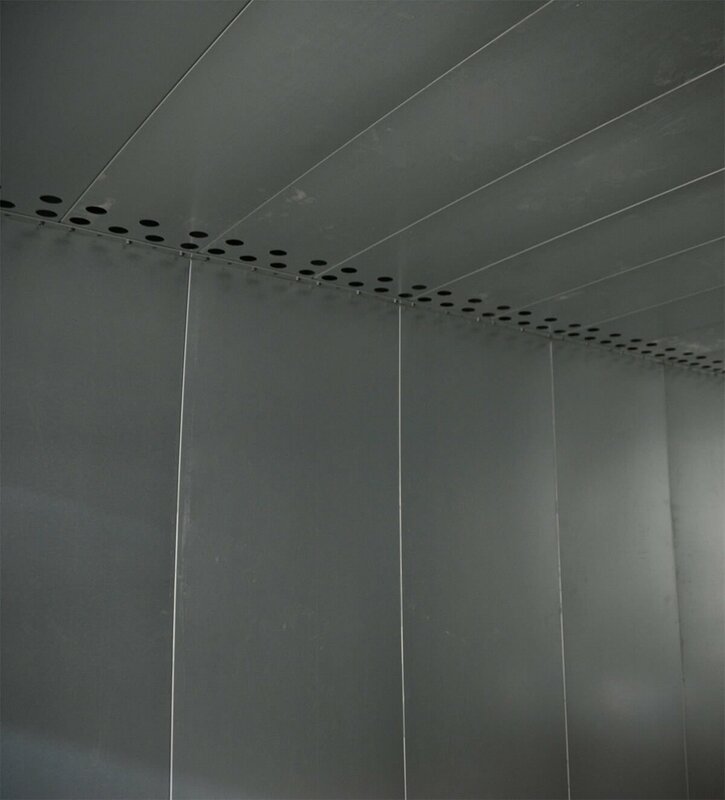 In order to get a proper finish, the parts can’t touch the ceiling, ductwork or walls, and they can’t impede the operation of the doors or rub against them. Also consider how the parts will be carried in and out of the batch powder curing oven. Most parts are hung on rolling racks (also called parts carts), so there has to be enough room for the rack to fit into the oven once the parts have been hung. If your rack bumps into the walls of the oven, the powder you applied can get knocked off. Just like you will need to allow for room near the walls, ceiling, doors and ductwork, you also need to avoid hanging parts so that they nearly drag the ground. If possible, the lowest part of the biggest parts should be 10” or more off the floor. This makes the temperature of the parts more uniform and allows the powder to cure more evenly. It also helps prevent dust contamination if the oven’s heat system blows dust and dirt from the floor onto the parts. Some ovens have better temperature uniformity than others, but none are perfectly uniform. Ovens with ceiling ducts are usually cooler at the floor than elsewhere. Ovens with wall ducts may be cooler in the corners, and possibly near the floor. It is recommended that you routinely check your oven’s temperature with an oven data recorder (a Datapaq or similar) and keep a log of the results. Get professional help fine tuning your oven and adjust your curing practices as needed. Although it might not be obvious, drafts and air currents in the shop influence the way an oven operates. Some days there may be giant wall-mounted vent fans in operation to help keep the shop cool or get rid of welding fumes. Other days there may be one or more heaters in operation to keep office or shop space warm. Many shops have roll-up doors that are constantly being opened and closed. Wind can blow into the building or move across openings and create an imperceptible vacuum or pressurize a shop in ways that can easily overcome a powerful fan system. All of these things can impact your oven’s performance. If you notice a change in your oven’s performance, check for changes in the way air moves through your building. Is air blowing in from outside that wasn’t a few days ago? Were the building exhaust fans turned off but the vents left open? Have you started using an AC system or have you cranked up heaters that weren’t in use until recently? Does the oven only have problems when a roll-up door is opened or closed? Examining the airflow within the shop can often help you pinpoint oven operation issues. Another factor that can make a huge difference in the way an oven runs is fuel supply. Whether your oven is burning LP or natural gas, changes in the fuel supply can cause problems that are almost impossible to trace. These issues can be due to weather changes, new construction near your shop, changes within your building, or changes to your style of use. If an oven is calibrated during the summer, the gas supply may decrease during the winter because of increased demand. This may be due to your neighbors (especially if located near a hospital, apartments or a large office complex) or may be because you’re using more fuel to run heaters or gas-fueled appliances within your own building that are tied in to the same line feeding your batch powder curing oven. A similar problem can occur if new apartments or other types of high-demand buildings are constructed near your building. Once occupied, they may cause changes to the fuel supply coming into your building. Along the same lines, if you add shop heaters, steam units, or additional ovens, it may reduce the amount of available LP or natural gas fuel. Remember, gas pressure and gas volume are not the same thing. It is possible to have a situation where the pressure gauge shows plenty of pressure when the oven is at idle or turned off, but then have performance issues once the oven goes to high fire. This usually happens when the supply line or regulator is too small. The oven can also have problems if the supply has enough volume, but the pressure is too high (dangerous and can cause the safeties to trip) or too low (can cause the oven to fail to ignite or to take too long to get to curing temperature). For best results, the oven needs an adequate volume of gas delivered at just the right pressure. IMPORTANT: If your shop’s work schedule becomes busier or you change operators, it is possible to have oven issues crop up because of the way the oven is being used. One common problem is caused by operators opening the oven doors for loading/unloading while the oven is running. This is unsafe and can lead to property damage, serious injury or death. It also causes the heat system to burn a large amount of fuel as it tries to maintain curing temperature while heat is rapidly escaping from the oven through the open doors. Not only does this waste fuel, it can reduce the service life of expensive oven components because of the burner’s extremely high output. When you’re ready to open the oven doors, shut down the burner but leave the fans running. Turning off the fans while the oven is at curing temperature can cause them to warp or can cause related parts to fail prematurely. 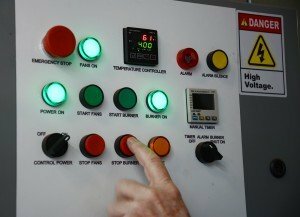 Every powder coating oven manufacturer provides a maintenance schedule which outlines the safest and most effective ways to operate their equipment. These factory-recommended “best practices” describe the style of use that is safest, most efficient in terms of manpower, least expensive in terms of fuel use, least likely to result in down-time due to equipment repair, and most likely to prevent unusable powder coated parts that are rejected due to poor finish quality. There’s a reason why successful shops that are noted for premium quality work or incredibly high throughput keep their equipment in top shape and operate it properly. Having a set schedule for cleaning, maintenance and lubrication of your batch powder curing oven and related equipment will help you get consistent, high-quality finishes. Similarly, only running the oven within recommended temperature ranges is not only more fuel-efficient, it is safer for your operators and less likely to damage parts. Oven providers typically offer strict guidelines designed to assure that you get the best results from your equipment and the highest level of efficiency. Following those guidelines will help save you from expensive equipment repairs and costly parts reworks due to bad finishes. Reliant Finishing Systems batch powder curing ovens are always set up by our factory-authorized technicians to provide performance that is well balanced. We want our ovens to reach operating temperature quickly, while burning as little fuel as possible, and we are committed to helping shop owners keep our equipment in the best operating condition possible. If you have any service or maintenance issues, please give us a call today. Scheduling a visit from one of our factory-authorized technicians can help solve curing issues, improve your efficiency and increase the lifespan of your equipment. Available services include troubleshooting, Datapaq recording and line audits, preventative maintenance, and both routine and emergency repairs. Call today for more information or to schedule an appointment. This entry was posted in News on August 3, 2016 by Reliant News.